The Big Tick Project has recently published the results of a large scale survey of tick infestation in UK dogs which found a considerable increase in prevalence. Climate change is thought to be one of the factors responsible for some of the large scale changes in the distribution of plant and animal species that have been occurring globally over recent years. Implications are particularly worrying when species that act as vectors of disease spread or increase in numbers as these changes are often associated with the concomitant increase in diseases. Not only are several mosquito species increasing their range, ticks, which are very susceptible to climatic and environmental changes, have been reported to be increasing in abundance and their distribution expanding northwards and into areas of higher altitude in Europe. Ticks are small arachnids (spider like organisms) that are external parasites, feeding on blood. Of the two major groups the hard ticks (Ixodidae), as the name implies, have a hard shield on their back which makes them difficult to crush. They stay attached to their hosts for many days, slowly swelling as they imbibe a blood meal. In contrast, soft ticks have a spongy back which extends over their mouthparts so that they cannot be seen from above. Soft ticks feed rapidly then drop off the host. Ticks are responsible for the transmission of a variety of pathogens to humans and other animals, including bacteria, viruses and protozoans. Notable amongst these pathogens in the northern hemisphere is Borrelia burgdorferi, s.l., the causative agent of Lyme disease and the rickettsial pathogen Anaplasma. An estimated 2-3000 new case of Lyme disease are thought to occur in England and Wales each year. 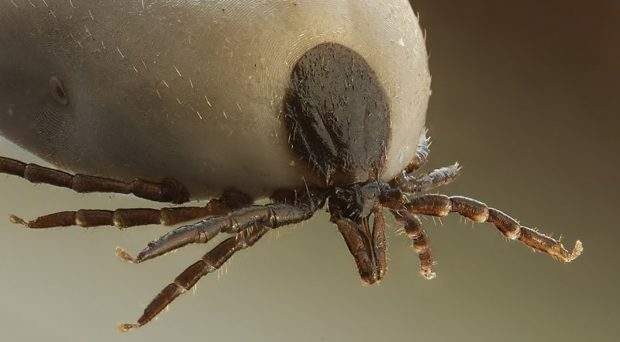 In Europe, the vector for Lyme disease is the sheep tick, Ixodes ricinus, which is widespread in grassland, moorland, woodlands and heath and in urban and suburban habitats. It is the most likely tick to bite people in Britain. As tick abundance and range increases, concerns regarding the likely increase in the incidence of tick-borne disease are growing. For instance, earlier this year BugBitten blogged about the first occurrence in the UK of canine babesiosis, a dog disease caused by a single celled parasite that is transmitted by the hard tick, Dermacentor reticulatus. Disease occurrences such as this are fueling increased interest in the mapping of the current distribution of tick species in the UK. As mentioned in that recent blog, the Big Tick Project, led by Richard Wall of the University of Bristol, is attempting to increase awareness of ticks and tick borne diseases. This summer Richard Wall’s team published a report of a national survey of tick abundance on dogs in the UK in the journal Parasites and Vectors. A total of 1094 veterinary practices were recruited into the study. The practices were located throughout Britain (with the exception of the far north of Scotland) and their distribution reflected population densities. Each practice was instructed to examine 5 different dogs each week for eight weeks. A detailed examination was prescribed including special attention to the dog’s ears. Ticks were removed with forceps or a tick hook and sent to Bristol for identification, together with a questionnaire detailing the dog’s history. Following the removal of records from practices that were suspected of over or under reporting, 7102 dogs remained in the study. Out of these just over 30% of them had ticks. The median number of ticks per dog was 1; however, one dog had approximately 200 ticks. The majority were adult ticks that had taken a full or partial blood meal. Although some samples were damaged, the group was able to determine the species of 5915 ticks. The hard tick, Ixodes ricinus (the vector for Lyme disease and Anaplasma) was by far the most common tick. Six other species were identified, two of which were only collected from dogs that had been abroad recently. It is clear that travel abroad represented a hazard as 43 of the 56 dogs returning from abroad within the previous two weeks were infested. In addition to the 2 species only found on dogs that had returned to the UK in the previous 2 weeks, I. ricinus was found attached to 29 of the dogs that had just returned from abroad. Ten dogs, located in Western Wales or SW England, were infested with Dermacentor reticulatus, the vector for canine babesiosis. Analysis of the distribution of ticks recovered from dogs throughout the UK showed that Scotland, south west England and East Anglia had the highest prevalence of infestation. A calculation of the risk factors associated with the likelihood of a dog being bitten showed that pastoral or gundog breeds were most at risk and older dogs were more at risk than those under 1 year. Tick distribution and abundance is highly dependent on microclimate, which will be influenced by vegetation, the availability of hosts and the climate, and these factors may vary from year to year in any one location. In this survey, the proportion of dogs found to be infected with ticks was considerably higher than previous studies. This may indicate that ticks are on the increase in the UK or it could reflect a season with particularly good conditions for ticks. However, as the authors of the study rightly point out, using veterinary practices as a source of dogs for the study may, in itself, result in over-reporting. The Big Tick Project has undoubtable succeeded in drawing public attention to the widespread distribution of ticks. The discovery that 30% of the dogs admitted to this study carried at least one tick received considerable press coverage recently, with journalists paying special attention not only to the diseases they might transmit but also to the risk to dogs being exercised in urban parks and woodlands as well as in the countryside.